Emerald - the birthstone for the month of May. A vivid green stone which has been a captivating and well loved gem for centuries. 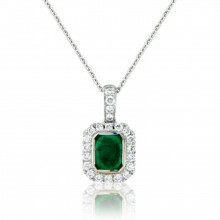 This Emerald is oval cut and has a simple White Gold claw setting and gleaming Diamond surround. The Pendant is strung on a fine white Gold chain. A traditional and elegant design beautifully executed by exceptionally skilled jewellers.